Do Lionel Messi & Cristiano Ronaldo thrive on each other's magic? 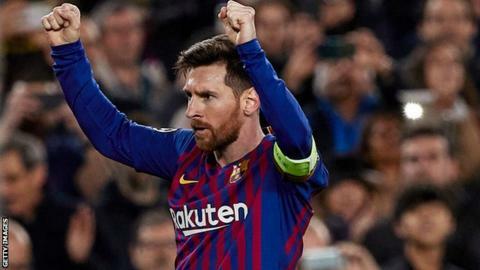 A night after Cristiano Ronaldo recorded a magnificent hat-trick to propel Juventus past Atletico Madrid and into the Champions League quarter-finals, his old nemesis Lionel Messi followed suit with a decisive contribution of his own to send Barcelona past Lyon. In a sense, Messi even managed to surpass Ronaldo by providing four goals: two scored by himself, and two more expertly set up for Gerard Pique and Ousmane Dembele. The victory allows Barca to keep La Liga's flag flying as the sole Spanish representatives in the last eight, as well as keeping Messi on track to fulfil his pledge - delivered in a surprisingly forthright pre-season speech to fans - to bring back the European crown for the first time since 2015. And, of course, it keeps one of the greatest rivalries in football history moving nicely along. Do Messi and Ronaldo inspire each other? If Cristiano Ronaldo didn't exist, would Lionel Messi have to invent him? The question of how much these two other-worldly players inspire each other is an interesting one, and it's tempting to imagine Messi sitting at home on Tuesday night, watching Ronaldo destroying Atletico, angrily glaring at the TV screen and growling: "Right, I'll show him!" As appealing as that picture might be, however, it is probably a false one - from Messi's perspective, at least. He might show it in a different way, but Messi is just as competitive as Ronaldo. Rather than goals and personal glory, however, the Argentine's personal drug is trophies. Ronaldo, it can be said, never looks happy on the field of play unless he's just scored a goal - and even then he's not happy for long, because he just wants to score another one. And that relentless obsession with finding the back of the net has undoubtedly played a major role in his stunning career achievements. Messi, though, is a different animal, shown by the generosity with which he sets up team-mates even if he has a chance to shoot, regularly hands over penalty-taking duties to others and invariably celebrates a goal by turning straight to the player who passed him the ball with an appreciative smile. Rather than being a better player than Ronaldo, Messi's main motivations - according to the people who are close to him - are being the best possible version of Lionel Messi, and winning as many trophies as possible. That theory was supported by Leicester boss Brendan Rodgers when I interviewed him for a book I recently wrote about Messi. Do Messi and Ronaldo inspire each other? "Maybe subconsciously in some way they've driven each other on," said Rodgers. "But I think both those players inherently have that hunger to be the best players they can be. With the very elite performers, that drive comes from within." Messi and Ronaldo ferociously competing with each other for everyone else's acclaim is a nice story for fans to debate and the media to spread, but it's probably not particularly true. Another notable aspect of Messi's two-goal performance against Lyon was the manner in which he converted his first-half penalty: a cheeky Panenka-style spot-kick which sailed slowly straight down the middle of the goal. Messi has taken very few penalties in the Panenka fashion before, but it's probably no coincidence that Wednesday's effort came just a couple of weeks after his team-mate Suarez netted from the spot against Real Madrid at the Bernabeu…with a Panenka. Messi might not consciously compete with Ronaldo, but you can be sure that he is extremely competitive - in the nicest possible way - with his great mate Suarez, and it would be no surprise if they had set up a personal competition for the best Panenka after training ground practice sessions. At the very least, it's something for them to have a good chuckle about on Thursday morning's school run - just like their dads, Thiago Messi and Benjamin Suarez are big buddies and attend the same school in Castelldefels, a seaside town on the outskirts of Barcelona. Although he didn't score on Wednesday night, Suarez was outstanding during Barca's fast start to the game, and his partnership with Messi will be fundamental to the team's ongoing progress in the Champions League. Their obviously vital role could mean they are held in reserve for several league games in the coming weeks: Suarez has admitted he should have rested more during the run-in this time last year, which saw a tired-looking Barca implode with a 3-0 second-leg quarter-final defeat against Roma, and the South American duo will be eager to avoid making the same mistake twice. With a seven-point lead over second-placed Atletico in La Liga, there should be plenty of opportunities for them to put their feet up and stay fresh for the Champions League, and Barca are in the luxurious position of being able to focus their main attention on just one competition. To win it, however, they may just have to get past a familiar foe. Messi v Ronaldo in the Champions League final, anyone?